The pitchforks are out across the Internet and those who wield them want Tom Brady to explain himself. But he owes them absolutely nothing. Some will inevitably view the New England Patriots’ fifth visit to the White House with heightened criticism in light of the connections between the president and the quarterback, as well as the team’s coach and owner. But this is much ado about nothing, as their relationships are quite normal considering the status of those involved. On day one of Donald Trump’s campaign, the billionaire made his allegiances known. When announcing his candidacy at Trump Tower, Trump wasted no time comparing the relations between Chinese and U.S. leaders to a Brady-led Patriots team against your average high school squad. This name drop surprised no one, first of all because the Patriots are a successful team, but secondly because Trump and Brady are friends. 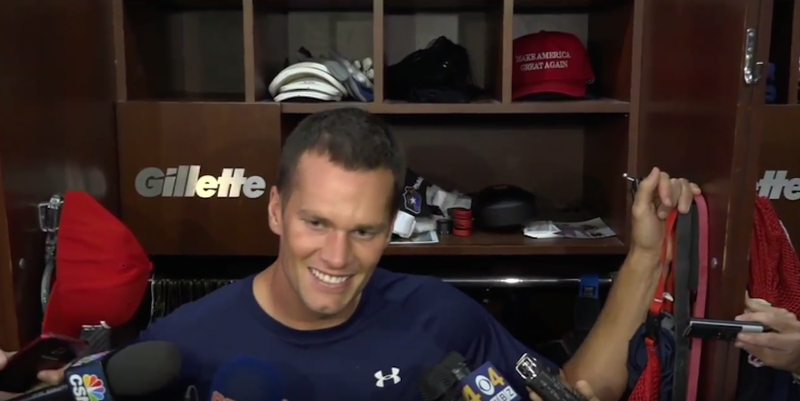 Trump sent the hat after Brady’s “Deflategate” suspension was overturned in district court. Referring to the National Football League, Trump had said, “What they’ve done to him is terrible.” He dubbed Roger Goodell, the league’s commissioner, a “stupid guy,” “weak,” and a “dope.” And he encouraged Tom to sue the NFL for defamation. The two have a mutual friendship dating back to 2002—when Brady started winning Super Bowls. That year, Brady judged one of Trump’s beauty pageants. The four-time Super Bowl MVP has said Trump is “a hell of a lot of fun to play golf with.” Apparently they call each other every now and then, with Trump giving Brady motivational speeches. There is nothing all that surprising about any of this. Fast-forward a few months, and people began to look back on Brady and his hat with new suspicions. Trump won the Republican nomination, and multiple times during his campaign stops throughout New England restated his support for Brady as the Deflategate saga wore on, moving on up to the Second U.S. Circuit Court of Appeals. Trump even seemed open to “firing” Goodell for using his power to instigate what many saw as a media-propelled witch hunt. Interestingly, the Trump-Patriots connection widened to Bill Belichick when, on election eve in New Hampshire, Trump read aloud a letter of support from the future Hall of Fame coach. The next day, the media was, of course, chomping at the bits to pester Belichick about this. He gave a reasonable, thorough response: his comments were not politically motivated since “anyone who’s spent more than five minutes” with him knows that he is not a political person. Belichick even mentioned how John Kerry (like Trump) had been in the Patriots locker room not long before that, and how he writes letters to hundreds of people with whom he doesn’t agree 100 percent. But that wasn’t enough for them. Belichick was immediately asked follow-up questions to a statement that should not require any more talk. So he stonewalled them, as he is known to do. This time it was particularly appropriate. When Myra died, Melania and Donald came up to the funeral in our synagogue, then they came for memorial week to visit with me. Then he called me once a week for the whole year, the most depressing year of my life when I was down and out. He called me every week to see how I was doing, invited me to things, tried to lift my spirits. He was one of five or six people that were like that. I remember that. Barry Petchesky whines that he’s simply “fed up with Tom Brady.” (Go put on a Jets, Colts, or Ravens jersey and join the club, dude.) He writes: “It’s only now, when he’s facing questions and criticism, that he thinks the friendship should be off limits. But it doesn’t work that way. If you stake out a position, you need to own it. Or if you’ve had a change of heart, explain why.” Petchesky “doesn’t know” what he wants Brady to do now. I guess he’s just so shaken up by the whole thing. Guess what, folks: Tom Brady does not owe anyone—especially the same press that hounded him over Deflategate claims—an explanation any more than a player who voted for Hillary Clinton has to explain himself. No one would bother if the tables were turned. This is just the Victorian-esque progressives carrying out their self-imposed duty to “check in” on others to make sure they are thinking and acting “properly,” and to police and shame them publicly if they are not. We all have the freedom to express our political beliefs as well as the freedom to keep quiet whenever we want. To demand explanations is pushy and obnoxious. If an explanation is all these people want, would they really just go away if Brady said, “I agree with Trump’s stance on immigration and I think he’s doing a great job so far”? It’s probable that they would crucify him. Barry Petchesky whines that he’s simply ‘fed up with Tom Brady.’ Go put on a Jets, Colts, or Ravens jersey and join the club, dude. When asked this past week on his relationship with Trump, Brady, like Belichick, said, “If you know someone, it doesn’t mean that you agree with everything that they say or do.” And he’s right. This, unfortunately, is lost on many. It has become fashionable to pin others into a corner because of another person’s remark and try to blow it up. The politicization of the obscure is not only off-putting, but when used against a select few who don’t “fall in line,” it resembles an inquisition, as W. James Antle calls it. The politicization of sports, furthermore, cannot be justified by the fact that there are many links between sports figures and politicians. Let’s not pretend the Trump-Patriots connection is extraordinary and therefore warrants our attention. Look at all the other NFL owners who have donated to campaigns. This is not new; don’t act like it is. Has Trump’s appointment of Jets owner Woody Johnson as ambassador to the United Kingdom been overlooked because the Jets—dare I say it—are just not a good football team? When Trump welcomed his three friends to the White House to celebrate the Patriots’ fifth Lombardi trophy, Brady should have felt free to pull out that red hat from his back pocket, put it on, shake the president’s hand, and smile at the cameras—and he still would not have to say anything to anyone about it. William Vaillancourt is a writer and editor from New Hampshire, where "Live Free or Die" is not a challenge to succeed in absolutes, but degrees.